Welcome to Quick Fix Friday! The blog post of the week where I share a tiny tip that has helped me survive with my baby twins. Sometimes, in the delirious, sleep-deprived haze, it’s the little things that stop you from snot crying over spilled breast milk (do you REALISE how long it takes to express that stuff?? Anyway…). As a parent, strange things come up all of the time that you’re having to deal with…runny poo, gunky eyes, teething rash…the list goes on. One thing we had to deal with was cradle cap. For anyone who hasn’t heard of this before, cradle cap is greasy, yellow scaly patches that sometimes appear on the scalps of young babies (you can find out more information about cradle cap on the NHS website). How to treat cradle cap. We found that rubbing coconut oil into our baby’s scalp twice a day helped to get rid of it. This stuff is magical. I would gently rub it into my baby’s scalp twice a day. It only took a couple of weeks for the cradle cap to completely disappear! It also makes them smell delightful too. Do you have any little tricks that have helped you with your little one? Hi parents. Do you find, day after day, at home with your little babies, you are sometimes grasping at things to keep your babies entertained? I definitely overthink how to provide stimulation for our babies…and then mum guilt creeps in… Am I doing enough with my babies? Am I reading them enough stories? Talking to them enough? Do we have enough cuddles? The worries are endless. However, finding myself stuck indoors for the day (our walk had to be abandoned as Francis was unwell) I suddenly had a light bulb moment. Why not just adapt what resources I could find around our flat for the babies? How to make a sensory den. Babies love to be in small spaces so I put this den together in less than 5 minutes! All you need are a few items that you can find around the house. To make it extra special before bedtime, you could always turn the lights down really low so that the fairy lights are beautifully bright, play some lullaby music and add a drop of lavender nearby so that it helps them to transition into bedtime. As the babies become stronger, further develop their grasping skills and are able to sit up on their own, I am planning on exploring sensory play in more depth. Watch this space! It’s great to change the items that you have in the den to keep it interesting for the babies. You could hang some rattles or cutlery from the top of the den so that the babies can make music, add a tiny lavender drop nearby to help bedtime preparations or shine different coloured lights through the top of the den. I would love to hear your ideas on what to add to make a den even more spectacular. As a parent, after a few months you finally start to feel like you kind of know what you’re doing. Routines start emerging and you know your baby’s cues. That is until they grow a little more, change the way they are doing things or learn a new skill. Then it’s back to the drawing board in search for the new solution. It’s funny how you are pushing for your baby to meet the next pending milestone and then when they actually do it, you instantly regret it. We experienced this feeling last week, where Beatrice had finally learnt how to roll over onto her tummy. The bad news was that 1. She actually hates tummy time, so being on her front was not fun, and 2. She did not know how to roll back over onto her back. Problems. Although I went from being a mumma who could leave her 5 month old twins on the floor and drink a ‘hot’ cup of coffee (lucky, I know) overnight I became a yoyo…up, down, up, down, turning Beatrice back onto her back as she wailed louder than a banshee as she miserably flapped on her tummy like a poorly seal. Now, I didn’t mind it because it is all a learning experience for her and she needs to struggle a little bit before she can actually turn herself back around. But what troubled me was bedtime. What if she rolls in her sleep? Will she be able to turn her head enough to breathe? What if I don’t hear her on the monitor? Worry, worry, worry. How to stop your baby from rolling over at night. As I prepared for our new arrivals, I tried to plan for every eventuality (you’re not that surprised really are you?). I knew the likelihood of having a caesarean was quite high so I had that in my mind as I organised all of the baby paraphernalia around our home. Although I had taken a lot of pride in setting up my baby changing station in the nursery, I knew that after day 1 of walking up and down the stairs every 2 hours day and night to change a nappy was not going to last. So to help ease the nappy changing fiasco I set up baskets of baby changing items around the house. These included: nappies, baby wipes, cream, nappy bags, 2 spare sleep suits and 2 spare vests (ready for any nappy leakage!). Pete laughed at me as I placed them around the house, but as soon as we had two 5 day old babies come home from hospital at 10.30pm, I can tell you he was rather grateful. It’s the small things I find that really help and this was one of them. Setting up mini changing stations around your house can help with the endless day and night nappy changes. Put mini baby changing baskets around your home so you can easily change your babies. Do you have any little tricks that helped to ease the nappy changing times? Singing time. Yes, you might not be Beyoncé but I promise your baby won’t judge you. Babies love to hear the sound of your voice and listening to you sing actually aids language development. Don’t worry if you’re not familiar with many nursery rhymes, I just sing what the babies and I are doing at the time…e.g. ‘Oh wow aren’t you cute, you’ve puked on me and your baby suit’/ ‘What is that smell? What is that smell? Is it Francis’ nappy that smells? What a stinky baby, That is the smell’ / Beatrice is a dribble dribble monster, who likes to pull my hair, she is extremely cheeky and vomits everywhere’. You get the idea. Reading. If you follow my Foxfairy Twins Instagram page you’ll know how much I love reading with my babies. It’s such a wonderful activity that allows you to have quality time with your little one. And it is never too early to start reading with a baby! Of course at this stage it doesn’t really matter if you’re reading Baby’s First Book or the latest IKEA furniture guide (nice one Pete). They will just enjoy listening to your voice. It is never too early to start reading to your babies! Such a lovely activity to do with your little babies. Bath time. I love bath time. It’s a chance for me to spend quality time with each baby. Our twins love being in the water. 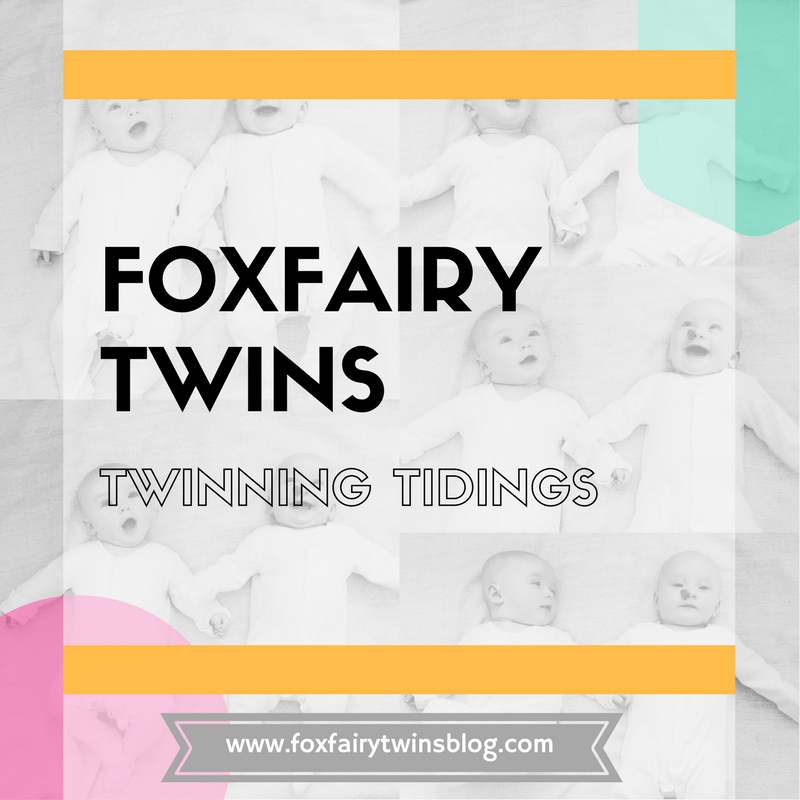 If you haven’t already, you can read my post on Bathing Twins for more information about how I organise this with two young babies. At first they would just lie there like dead fish, but now they’re stronger they are starting to kick their legs under the water in excitement. It’s very cute. Dancing. Not only does shaking around to Radio 1’s Dance Anthems (I miss partying) entertains the babies, it helps to shake off some baby weight too (unless you counteract it with wine at the end of the night…oops). Lights. I have recently discovered the fabulous entertainment value in fairy lights. I try and experiment with them around the flat. I’ll hang them over the sofa / along the cot / put them into a jar / dangle them above the babies etc etc. That was the best £3 I have spent in IKEA. Colourful bibs. Tummy time has not been the most favourable activity in our household which has forced me to think of inventive ways of making it more interesting for the babies. I found draping a colourful bib over the arm of the sofa encourages the babies to keep their heads up for longer whilst they tried to focus on the pattern. Appliances. Ah. The washing machine. Post babies, you are not only on every day to cope with the amount of laundry we now have to contend with, but also to keep the babies entertained whilst I wash their bottles. The twins love watching the machine spin (I think they like the noise too). Go on, give it a try! Parent Hacks: Use the washing machine as entertainment for your babies! White noise. I cannot express the amount of love I have for white noise. It has saved us from numerous meltdowns and sleepless nights. Downloaded onto my phone, if the babies are a little grizzly or over tired and cannot calm themselves down, in a matter of minutes of turning it on they go from inconsolable nightmares to angelic, sleeping babies. It is my secret weapon. Propped up books. Sometimes when the babies are lying on the floor I’ll prop open a book and put it next to them. They enjoy twisting to one side to look at it (whilst helping them to practise how to roll at the same time). Concertina books are fantastic because you can open them out and wrap it around where the babies are on the floor or hang it above their heads for them to look at. Bubbles. What a mesmerising and inexpensive way to entertain little babies. Simply sit them in their baby chairs or on the floor and blow bubbles for them to watch. This is fantastic way to help them to focus their eyes on moving objects. Hairdryer. Very similar to the white noise tip. In the mornings I usually have the babies in the bedroom with me whilst I’m getting ready and as soon as I put the hairdryer on they drift off into a sleepy slumber. Extractor fan. Again, similar to using white noise. Sometimes I’ll walk around the flat with the babies whilst listening to the extractor fan. They love it. Lying in a different room. This might sound obvious, but if the babies seem a little bored but it’s too late in the day to go out, I lie them down in a different room in the flat. Just putting them down on a mat in the bathroom or onto our bed allows them have a chance to see different objects (and distraction is everything). Baby massage. You may have already read my post about A Day In The Life With Twins, if so you’ll know that my take on baby massage is basically rub in a bit of lotion or oil and job done. I do notice though, when I start massaging the babies they do enjoy it. So that’s a nice, calming activity to do with your babies. Rocking in the pram. I must admit I don’t really do this that often, however, when we were in the process of moving house and there were boxes everywhere, we strapped the babies in their pram to keep them entertained. They quite enjoyed it. I think they liked the mixture of movement plus seeing the room from a different view. Lying next to each other can be entertaining for little ones. Attend a local baby group. Now, I didn’t actually start doing this until very recently as the babies were always asleep so it didn’t seem worth while. However now they stay awake for about an hour at a time so I’ve recently started going and the babies love seeing and hearing different things in this new environment. Meet a friend for coffee and cake. Babies love to be out of the house and even if they stay in their pram sleeping for the time you have a coffee, cake and cheerful chat, it’s the perfect activity for all of you. My most favourite: Cuddles. Nothing will be more satisfying than having baby cuddles. It’s such a wonderful bonding experience for parent and baby (and gives you an excuse to take 5). Do you have any baby activities to share? I’d love to hear your suggestions. Setting up the changing area was one of my favourite jobs. Making sure every section was carefully planned and put together ready for the twins’ arrival created much anticipation (and calmed my inner OCD gremlin). Once the twins were finally here, I quickly noticed that I was fumbling around with the nappy bags, trying to desperately capture the hideous nappy stink bomb before we got covered in that awful baby poo (how…HOW can it smell THAT bad??!). Being a twin mumma, double nappy changes meant I repeated this process many times a day. I was growing increasingly frustrated that I couldn’t open the nappy bag whilst wrestling with the babies (how come if you look away for a second they’ve managed to plunge their foot straight into the poo and spread it across the whole room?? UHHH?!). I needed a solution. That’s when I took one of my stationary tins and started using it as a miniature nappy bin. I would open the nappy bag and put it into the tin, ready to capture the next stink bomb. The great thing about using this is that you can put the nappy into the bag one handed, whilst attempting to control your baby’s unpredictable octopus legs. It’s the simple things in life that make it better, don’t you agree? Do you have any suggestions on how to make nappy changing time a little easier? If you have a new baby, you’re probably wondering what a typical night time feeding routine looks like. If you have twins, I am sure you are even more intrigued by how others are surviving. This is my experience of night time feeding twins. If you follow my Foxfairy Twins Instagram stories you’ll know that sleep has been a tricky area for us. When you’re surrounded by young babies that sleep from 7pm – 7am (yes, I actually have a friend whose baby actually does sleep that long. Not bitter in the slighted) and endless information and guides which will advise you on how long a baby should sleep for, it’s no wonder this subject can be frustrating for a parent. Someone once said to me ‘you don’t know what the word tired means until you have a baby’ and gosh were they right. Before babies I was a serious napper and could fall asleep in 10 seconds for little bit of shut eye. I also needed my 8 hours of uninterrupted sleep at night else I would go from being Miss Honey to Miss Trunchball. Not pretty. Night feeding with twins. Once the babies have been put to bed, do not take them out of their room to feed at night. This helps them to stay a little sleepy. I use the curved cushions to prop the babies up, feed them and then put them straight back down to sleep. Thrown into the new whirlwind of having two newborn babies and well, you can imagine the shock. Feeding every 2 hours to begin with (am I the only one who didn’t realise that it means every 2 hours after you BEGAN the previous feed, not from when they finish? This means you could start feeding at 2.45am, the babies take almost an hour to feed, then include the nappy changes and settle back down to sleep, that takes you up to 4am, only to be awoken 45 minutes later for the next feed. It. Is. Horrendous. Now I understand why sleep deprivation is used as a form of torture). The only reason Pete and I survived this newborn demand was because we took it in shifts to look after the babies. As I was expressing and topping up with formula it allowed Pete to help me feed them (see my previous posts about Feeding Twins for more information about how we did this). We would each watch the babies for 6 hours so the other one could sleep for more than 45 minutes at a time. You would not believe how incredible you feel if you have been surviving on 3 disrupted hours of sleep to having a chunk of 3-5 hours of solid, precious sleep. It literally saved us from going insane. It also emphasised the importance of team work between Pete and I, especially in the early days. Fast forward to month 3, we began our bedtime routine (see my post about Bathing Twins) in order to establish good bed time habits. Once they were in their cot for bed time we would only feed them in their bedroom, using the curved cushions to prop them up. Once finished, I would gently pat them on the back and put them straight back down to sleep. I would also only change their nappies if they were soiled. Apparently, at this stage it is common for babies to start needing less feeds throughout the night so therefore shouldn’t wake up as often for feeding. HA! Sorry, was that a funny joke? Our babies were certainly not ready to give up their night feeds at this time. And the fact that I knew some babies could, made me feel frustrated. All I wanted was to sleep for more than 3 hours at a time (Pete was back to work so it was harder to work in shifts now). Swaddling can help a newborn baby to sleep. It mimics them being in the womb and helps them to feel safe and secure. It also stops them jolting and waking themselves up. That’s when I started reading lots of different sleep guides on how to help your baby to sleep longer at night. Some suggested giving more milk throughout the day (our babies refused, or would just projectile vomit it back up, probably as a protest to stop making me overfeed them), give a ‘top up dream feed’ where you feed the babies in their sleep at around 10 or 11 pm in order to help carry them through until the early hours (I tried this several times and I think I was actually disrupting their natural sleep cycle as they would then wake up after 2 or 3 hours for another feed. Greedy monsters) or when they do wake up for their 2am feed, try to pacify them for 10/15 minutes to get them used to having this feed later and in the end not need it until the early hours of the morning (HAVE YOU TRIED THIS WITH TWINS?? To pacify one baby when they’re screaming for a feed at 2am and you’re exhausted would be hard enough, but with TWO BABIES?! Not going to happen). So guess what we did? Nothing. We just let them wake up for their night feeds. And guess what? It has gradually started to stretch out. At the moment, being 4 months old, they now have their 6pm bottle, go to bed, wake up at around 10.30-11pm, then wake up around 3-4am. It’s not perfect, but we are definitely going in the right direction. I am now feeling calmer about it (if still a little sleepy-eyed) but progress is being made. I am hoping that when we begin weaning and they put on more weight perhaps they will surprise me by sleeping through until 6am (am I asking too much? Maybe. But I can wish). How does this compare with your little one’s night time feeding habits?